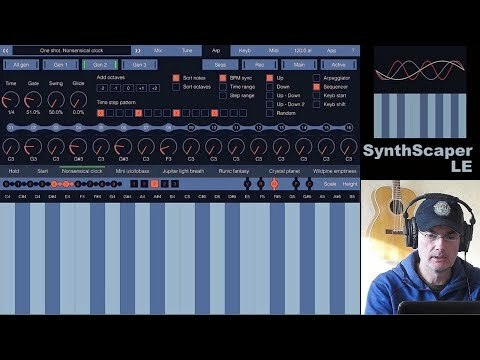 Great and totally free scenes pack for SynthScaper with 15 noise scenes and 55 samples from Noise Inc! "All sounds generated with SynthScaper app. No additional FX effects. All sound sources and textures used in demo were created by Noise Inc. This is a demo of Nose Inc"
- Save this file to your Dropbox. - In the SynthScaper app tap button "Files", then "Dropbox". - Select file "Scenes pack Noise Inc.synthscaper" and tap "Download". - After download, open scenes list, find and select item "* Scenes pack Noise Inc" in the main list. - Use button "(Un) Pack" at the title to unpack it. - You will see new group "Scenes pack Noise Inc" in the list that contains 15 scenes. - Also in the files list will be group with the same name which contains 55 new samples. - After unpack you can delete file "Scenes pack Noise Inc.synthscaper". Also you can download this file in any other way and then by using Files app save this file to the SynthScaper folder.